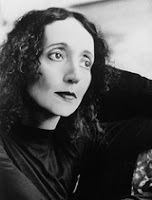 Want writing advice from master author Joyce Carol Oates? As The Huffington Post noticed and collected, all you really have to do is follow the 75-year-old author on Twitter. Oates is the author of more than 40 novels, including the National Book Award-winning them (1969) and three that were nominated for the Pulitzer Prize: Black Water (1992), What I Lived For (1994), and Blonde (2000). You can see the full bouquet here.